TBL 39 is a wrap – Designer Mick Lowe and I signed it off on Monday and it’s now at the printers. Distribution should commence at the end of next week. We really went some to get this one finished -we had done a little work on it early in the year but that all got way laid when we began the Earls Court project – and it was only after the Five Glorious Nights book was completed in early May that we got down to getting to grips with this issue. It’s been pretty non stop since then. The end result is another TBL outpouring- 40,00 words of it. Many thanks to all the contributors who have made this issue what it is, to Mike Tremaglio for overseeing the text and to Gary Foy for assisting with TBL 39 admin. 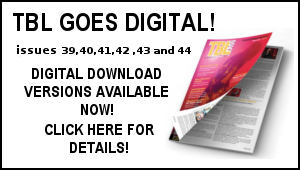 All current TBL 2014/15 subscribers will automatically recieve this issue. 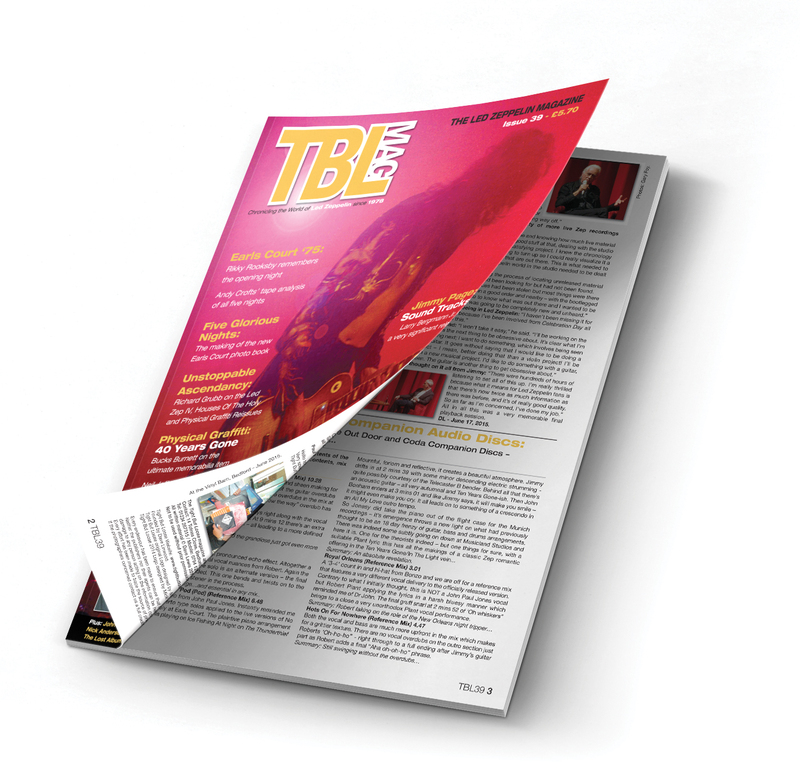 TBL 39 is the second issue of the TBL 2014/2015 subscription. If you have yet to susbcribe you can do so now – TBL 38 will be sent to you immediately with issue 39 to follow and issue 40 later in the year. Suffice to say if you are reading this, you will love this magazine…great summer reading to accompany this summer of Led Zeppelin with less than 30 days to go for the arrival of the final reissues. Tangible, collectable and that thrill of expectation of something eagerly awaited dropping through your mailbox. Don’t miss out! 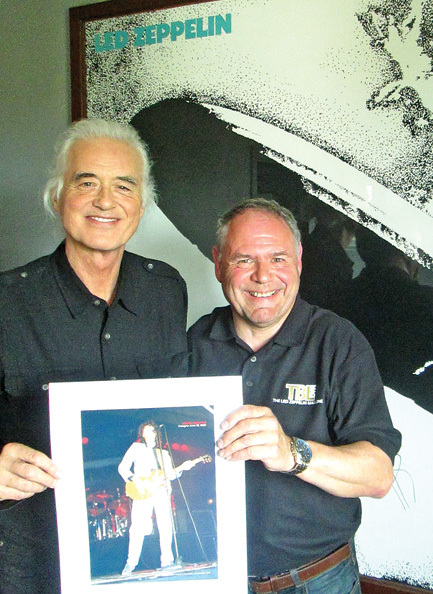 Jimmy Page talks Dave Lewis through the companion disc audio content of the final three Led Zeppelin reissues. On the spot report from the June 16 unveiling. Richard Grubb provides a perceptive overview of the second and third batch of Zep reissues. Dave Lewis on a monumental reissue. Bucks Burnett tells the story of how he secured the ultimate Physical Graffiti collectors item. Neil Jeffries takes tea for one at 96 St. Marks Place. Bucks Burnett on his first exposure to the epic 1975 double album. Larry Bergmann Jr reports from the Kenendy Center. Rikky Rooksby remembers the opening night. Andy Croft’s tape analysis of all five Earls Court shows. Dave Lewis on how the new Earls Court photo book came to fruition. Larry Bergmann Jr. explains why the new Jimmy Page Sound Tracks set is one of the most important of his career. Scott Heck contributes a new CD review column. Chris Charlesworth on his first encounter with some advanced pop exponents in 1969. Joe Jammer album, History of JB’s Book, Deborah and Jason Bonham latest, book round up and more. This is another epic issue –don’t miss out – order now! 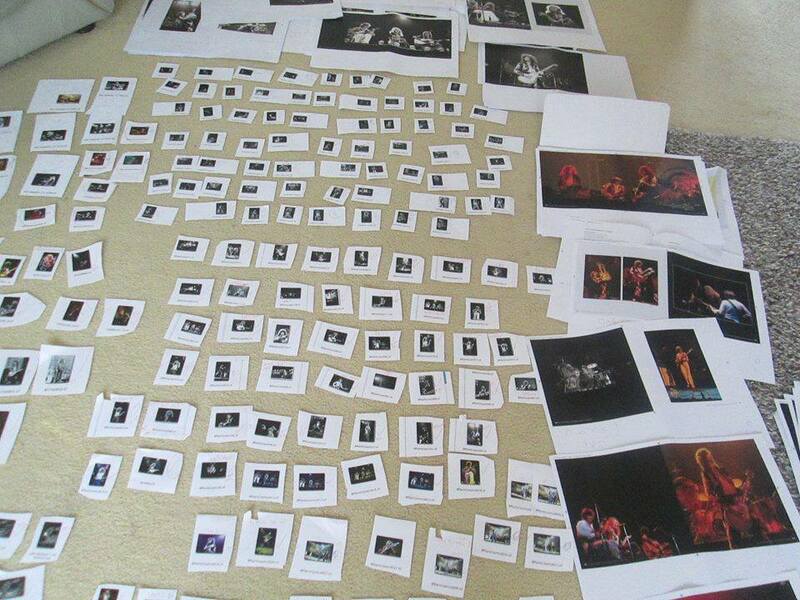 This was the scene in my front room on a Saturday afternoon in early March – I was laying out the contact sheets to try and find some order as to how I was going to formulate the Earls Court book – I can honestly say at the point the task seemed somewhat impossible and I was a worried man… however slowly with the brilliant design work of Mick Lowe we began to make progress….it’s therefore very heart warming to read the positive responses below from some of those that have received the book…this one was some challenge and I really felt the pressure to it justice. I recently went through a period of real insecurity over the book – all objectivity seemed to disappear – I really had lived with it for so long I was not really sure If what I had set out to do with it all and been achieved. Those who had been working on it with me and those close to me, were telling me it was some accomplishment…but I wasn’t really sure about it all – and I knew it was going to be for others to really judge – namely the people who had invested in what is a fairly hefty price for this book. So the type of response that has come in over the past week has been both gratifying and inspirational. My heart and soul went into producing this book – it is a subject very dear to me and countless other Led Zeppelin fans across the globe. It was essential that I did it justice. I hope I have. Rarely does a book come along that actually fully captures a monumental moment in history. But with the new Dave Lewis Led Zeppelin Earl’s Court book, it’s as if you are actually there with a front row seat! Dave’s left no stone un-turned. The book reminds me of the best of those Kennedy Assassination books where every photo, every angle, every nook and every cranny of Dealey Plaza was uncovered on that fateful day in order to document what unfortunately in that case would become the saddest event in American history. In contrast, the Dave Lewis book is again, a celebration. I immediately get that perspective with this monumental book. Right off the cuff, you get the feel of the buildup to the gig as the trucks pull up, unloading stage scaffolding and chairs even before the band’s equipment arrival! There’s ticket stubs, articles, set lists and reviews. You name it! But most importantly, photos from each of the five shows. And lots of ’em! And they’re not the usual far away shots, blurry, in-cohesive and foggy. They’re right up close and personal. Led Zeppelin’s 1975 Earl’s Court shows were the band at the top of the rock and roll mountain where literally no other band hand gone before them. They are firing on all cylinders. At their best, no other band could touch them. Argueably, many might feel the 1973 U S Tour captured the band at the top of their peak. Some fans may even feel that 1977 was better or flip-flop back and forth between 1973, the 1975 Earl’s Court shows or the 1977 U S Tour…like myself. Nevertheless, this is Led Zeppelin at their best. Confident, in full swing and explosive! The book is a nice compliment to the 2nd printing of Jimmy Page’s photographic biography. It has all the set lists and concert summaries as well as important tidbits from newspapers and reporters plus their quotes regarding these shows. You get a full spectrum of observations by many who witnessed these shows. This wasn’t just slapped together with “we’ll go with what we have” type of setting. It’s so full of gems, one would hardly think there’s anything left to add for a revised and updated version in the future! Not unless the former band members themselves would show up and say “I’ve been wanting to show this to the fans for years..” type of momentos. If you are a die-hard Led Zeppelin fan, this book will give you the clearest look at the band ever. Even better than anything the band’s record company could possibly slap together and would be neck and neck with anything the band members themselves would put out and that’s what’s nice about it! You can easily tell that this was produced by a dedicated Led Zeppelin fan. All of Dave’s books are still used by me on a daily and weekly basis and this one is right up there with them if not eclipsing them all. From the care, planning and assemblage, it’s all here! It’s not only Dave’s perspective or account of the five London shows from May of 1975 since he attended them all. But there are quotes and articles from many others which prove this was a monumental event for London’s Led Zeppelin fans and those from other countries lucky enough to attend. Many of the pictures are so close we can actually see the band members facial reactions and grins during the show. There are countless great shots of Page’s iconic black dragon suit, their equipment, Jones’s stand-up bass and more and I must say it’s going to take months if not years to thoroughly process all of it. Many Zep fans are musicians and we take the time to study Page’s guitars or Bonham’s drum kit and how it’s mic’d. It’s the best thing there possibly is short of the band actually releasing a DVD of these five epic shows. 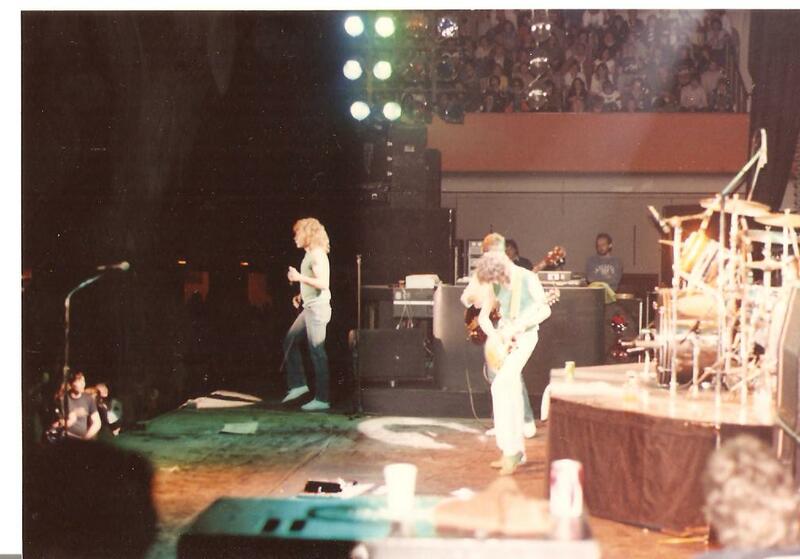 It’s Led Zeppelin….captured in the apogee of flight! The book includes all of the classic shots we’ve come to love and many more new ones! This is as good a non-video documentary as you could ever possibly hope to get! Fantastic! Scale of 1 to 5 with ‘5’ being the best: 5-star rating! Utter quality! Well done Rufus Stone and Dave Lewis! Thank you! 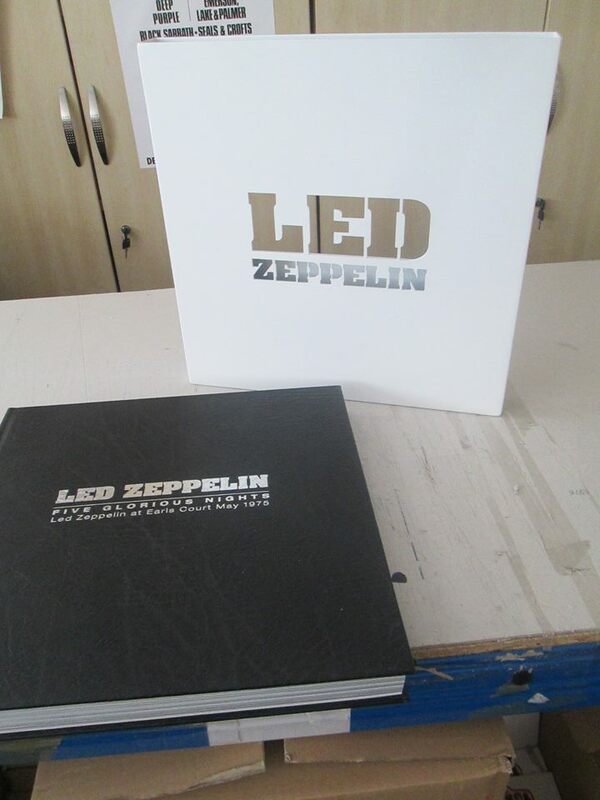 This book, released in late June 2015, is a visual tribute to the legendary five nights that Led Zeppelin played at Earls Court Arena in London, exactly 40 years ago. The first thing that strikes you about this big and heavy book is the size, it is exactly 12 inches by 12 inches, the same size as a vinyl LP. This is a homage to the hallowed vinyl by the publisher. Rufus Stone have in the past published some large and lavish books on Deep Purple, the late and great Ronnie James Dio, the Beatles, Whitesnake, and Yes, a rather eclectic variety of musicians and musical art forms by anybody’s standard! However with this new book on Led Zeppelin’s very famous, if not legendary, five nights at Earls Court, the publisher has pulled off a remarkable visual feat for all Led Zeppelin fans. As already stated, this is a large and heavy book, but it can still be ready comfortably with it resting on your lap. It is indeed most fortunate that the author of this book is Dave Lewis, the man behind the superb Tight But Loose magazine, and numerous excellent books about the band. Dave attended all five concerts, so he can write with considerable authority and insight about them, as he witnessed each one first hand. He has put in a tremendous amount of hard work into this project, in fact as he just said to me in an email: “I put my heart and soul in that one, and then some!”. The book is heavy because of the high quality paper used in the printing. As the publisher advised me, it would have been a lot cheaper to have this printed in China. But quite clearly this book has been produced on the highest quality terms alone, not on costs. Hence why it is an expensive book, limited to 1000 numbered copies, each signed by the author. There is also a super deluxe leather bound edition, strictly limited to 100 signed and numbered copies, inside a white powder coated slipcase, that is completely sold out. The book opens with a lovely introduction from DJ Nicky Horne, who introduced the band on the 24th May. He recounts that a few days after the concerts he was given a beautiful engraved Asprey’s silver goblet as a thank you, a lovely jesture from the band. Dave sets the background to these May 1975 concerts with a review of the North American tour that had run from late January to the end of March. This is followed by a detailed look at the the massive organisation and logistics of preparing for these five mammoth concerts. Each of the five nights are then covered, illustrated by countless superb colour and black & white photos from the well known photographers who were lucky enough to get passes for the shows. Intersperced on the pages are quotes from the press reviews, but mainly from what Robert Plant said each night to the audience. The quality of the reproduction of these photos is outstanding, and they add up to make this book one of the finest rock concert records extant. As a serious photographer myself (I bought my first Pentax SLR in 1971), I can appreciate the difficulties in shooting on film (negatives or positive slides) using only available light, at a concert with constantly changing conditions. With today’s massively powerful DSLRs it is straightforward to crank up the ISO and get shot after shot bang on. It was very much harder in those days, manually focussing as well. So the photos displayed in this book are a testament to the professionalism and skills of these photographers. Apart from the photos there are also colour reproductions of the adverts and posters, and at the end of the book all the tickets, bootleg LPs, CDs and DVDs are also illustrated. Having carefully gone through the book, it is still very difficult to pick out my favourite photos, as there are so many great ones to choose from. Suffice it to say, this book is crammed full of outstanding images, which will bring great enjoyment to all fans lucky enough to own this book. Combined with the extremely high standard of printing (rare in this day and age), this all adds up to a truly wonderful record of those five concerts from exactly 40 years ago. There are also interviews with the promotor, Mel Bush, one of the photographers, Barry Plummer, and finally the music journalist Chris Welch. The book concludes with a brief resume of the events that followed these concerts, with Robert’s terible car accident just a few months later, that ground the juggernaut that was (and remains) Led Zeppelin to a halt. And also a look at the stupendous double LP that was the highlight of 1975, “Physical Graffiti”. The very last photo in the book, on the last page, is most aptly one of John Bonham, hard at work behind his drum kit. Without him there would be no Led Zeppelin, and there never can be again, he was totally irreplaceable. 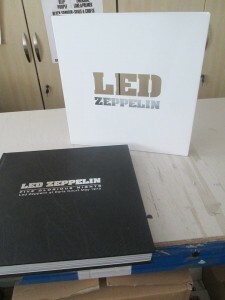 Every serious fan of Led Zeppelin needs this beautiful and superbly printed and produced book. (Jules McTrainspotter June 2015). Jules McTrainspotter June 2015 via Underground Uprising website. Many thanks for all your feedback – I am a man humbled by the response. I spoke to publisher Mark Smith tonight. He informed me that 80% of the standard issue pre orders have now been shipped. The remaining orders are mainly overseas and will be on the way in the next few days. The leather bound edition with metal slip case (which looks amazing and sold out on pre-orders alone weeks back) are now being collated for shipping. Some went out today, the rest will filter out in the next few days. Mark and his team have been doing a great job under the sweltering conditions of the past couple of days. So if your order has yet to be fulfilled – hold on it’s coming. Limited Edition of 1,000 only – don’t miss out. Jimmy Page has recorded a number of radio interview regarding the final three reissues including a slot for the Johnnie Walker BBC Radio 2 show and Nicky Horne’s Classic Rock Radio show. Keep an eye on the TBL and LedZep news Facebook pages for schedules. This clip has been doing the rounds – watch out Brad Pitt – here comes Robert Plant the actor! See YouTube clip below. Nugent and Belle will be guest support on both the previously announced Robert Plant and The Sensational Space Shifters Forest Live dates. Robert Plant and The Sensational Space Shifters have announced two special dates as part of Forest Live, the summer concert series promoted by the Forestry Commission. After nearly 50-years in music, Plant, continues to surprise and challenge his audience with music that is smart, exciting, and completely of the moment. His incredible legacy as the front man of Led Zeppelin and as a solo artist, only serves to keep pushing him forward. Returning to his native England after an extended sojourn in America, last year saw the release of his 10th ‘solo’ album, ‘lullaby and… The Ceaseless Roar’, his latest project recorded with The Sensational Space Shifters. The album received worldwide acclaim for its contemporary song-writing and brilliant musicianship. Following a recent sell-out tour of indoor venues, fans can look forward to an exceptional live show which will include tracks from the 2014 album as well as new interpretations of Led Zeppelin classics and other solo material from a long and very successful career. Forest Live is an independent programme organised by the Forestry Commission to bring forests to new audiences. Over Forest Live’s 14 year history, money raised has contributed to a wide range of projects, from wildlife conservation to making improvements for visitors. With everything required for a great night out, including full catering and bar facilities, the gigs are renowned for their relaxed atmosphere. 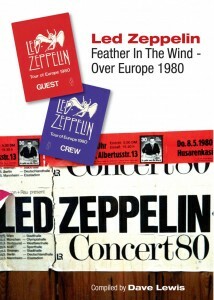 This month marks the 35th anniversary of the final Led Zeppelin tour – a low key 14 date trek taking in Germany, Belgium, Holland, Austria and Switzerland. To begin a month long celebration of that final tour, I have reduced the price of the Feather In the Wind book for a limited period to just £8 including postage and packing. This is a fantastic opportunity to invest in the definitive account of the tour at a bargain price – yet more Led Zep summer 2015 reading. For those who have yet to indulge, to give you a flavour of the contents – this is an extract from the introduction to the book. 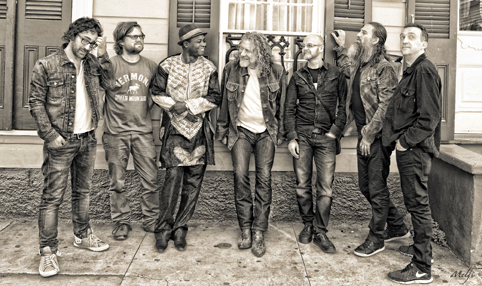 Robert Plant, with microphone in hands held aloft, is shaded by a single spotlight. Jimmy Page is showered in sweat but still grinning as his guitar tech takes the Gibson. To his right John Paul Jones is dapper and cool as ever after driving the Zeppelin rhythm section for nigh on two hours. John Bonham, happy and smiling, jumps from the drum rostrum and strides over to the side of the stage where manager Peter Grant, promoter Harvey Goldsmith and the esteemed head of Atlantic Records, Ahmet Ertugen, are ready to receive them in a joyous celebration. Indeed, Harvey is keen to preserve this moment, duly hands me his camera, and asks me to take a photo of him and Ahmet by the side of the stage. Tonight in Frankfurt, we all have every reason to feel extremely optimistic about the future of Led Zeppelin. Tragically, in less than three months, the band will grind to a halt following the tragic death of John Bonham. 31 years on, I am in StudioMix design studio in Bedford gazing at the various photos Tom and I took when we were situated on the side of the stage watching Led Zeppelin. 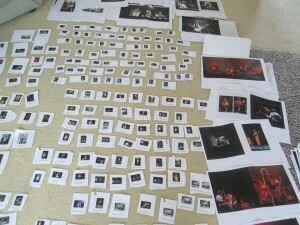 They are laid out before me as the collation and design of the book you are now reading commences. How on earth did I manage to secure this prime position up close and personal to Led Zeppelin all those years ago? I had been an extremely fervent Led Zeppelin fan from the day I first heard Whole Lotta Love powering from the radio when I was just 13 years old. I was totally hooked, and from then on this band became an integral part of my life. I took in their shows at Wembley Empire Pool in 1971, Ally Pally 1972, five nights at Earls Court, and of course two weekends at Knebworth. Every album they released, every move they made I soaked up with near religious fervour. By 1976 I was already penning my own reviews and notes on the group and had begun to harbour a massive desire to channel my dedication into chronicling the group in print. This initially bore fruit when I contributed to a four part series marking Led Zeppelin’s tenth anniversary in the late summer of 1978 for the UK weekly music paper Sounds. I had been eyeing creating my own Led Zeppelin fanzine for about a year, and participating in this well received series was the kick start to getting things moving. Ironically, I was inspired by the do- it- yourself punk fanzines of the day such as Sniffin’ Glue and Ripped And Torn. Led Zeppelin did not do fan clubs and gaining information was strictly down to whatever coverage Zeppelin were afforded in the then weekly music papers NME, Melody Maker, Sounds, Disc and Record Mirror. Back then, there was, of course, no internet and in the UK little radio coverage of rock music on TV or radio – and there were no blanket news channels, or even breakfast/daytime TV. In search of info, and keen to put my thoughts on paper and connect with like-minded fans, I created my own magazine – Tight But Loose (so called after an expression used by both Page and Plant in 1977 to describe their music). I handwrote issue number one (an Earls Court Revisited special), advertised it in the music paper small ads and the response was pretty instant. There were many more like-minded fans out there across the world that wanted to buy into this hub of info I was committed to supplying. Luckily for me, this self published magazine struck a chord within the band and their organisation. Within a year, I had developed the format from a hastily handwritten stapled booklet to a glossy A4 format with exclusive photos. The most recent issue – number four published in April, had gone down well within the hallowed walls of their Swan Song record company empire. Along the way, I had developed a good relationship with their then press agent and office manager, Unity McLean and other Swan Song personnel. They saw the intentions of this venture were genuine and seemed more than happy for me to produce it. Back in 1980, in between my job as manager of the record department at the local WH Smiths in Bedford, I spent a sizable amount of my waking hours, researching, writing and collating material for the magazine. This, of course, was long before the age of the internet, Facebook and Twitter. Today, there are literally thousands of ways to discover information about Led Zeppelin – back then there was precious little. Central to the function of the Tight But Loose magazine was the ability to produce up-to-the minute information to share. With Led Zeppelin preparing to tour in Europe, the objective was a simple one that spring of 1980. To report on it all I needed to be right there where the action was. So I hatched a plan with my good friend Tom Locke in Bedford to travel initially to the Cologne show. Work schedules did not allow for much more in that first week of the tour, but having attended that show and been totally amazed, there was no doubt we needed to be back out there as soon as possible . So it was, I singled out the week commencing June 30th to catch the gigs in Frankfurt, two in Mannheim and Munich.As you will discover in the book, many UK fans had the same intention and travelled into Europe to see them. They included original Zep author Howard Mylett, massive Zep/Page fan Mark Harrison and Manchester based fan and collector Steve Jones. In fact, Steve attended ten of the shows on this tour and enjoyed good access himself. There’s Robert smiling directly at us as he walked off the stage in Frankfurt. Jimmy handing over the Gibson guitar to Ray Thomas – tweaking the echoplex – singing backing vocals on Whole Lotta Love. There’s Jonesy driving them through Trampled Underfoot and Bonzo nonchalantly smoking as he thundered through the climax of Kashmir. There’s a magnificent shot of them all under the white mist of dry ice that accompanied the performance of Achilles Last Stand. There’s a handful of shots taken by fans out front where you can see Tom and myself at the side of the stage watching the action unfold (see the circled photos on these introduction pages). Alongside that is another note, this time written for me by Robert Plant in the Plaza Hotel after the Frankfurt show .The message says: “It works – contrary to public opinion’’. 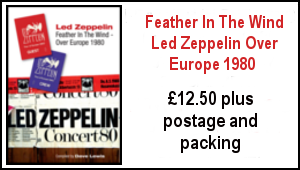 Extract from the book Led Zeppelin Feather In The Wind – Over Europe 1980 by Dave Lewis. SPECIAL 35TH ANNIVERSARY BARGAIN LOW PRICE! 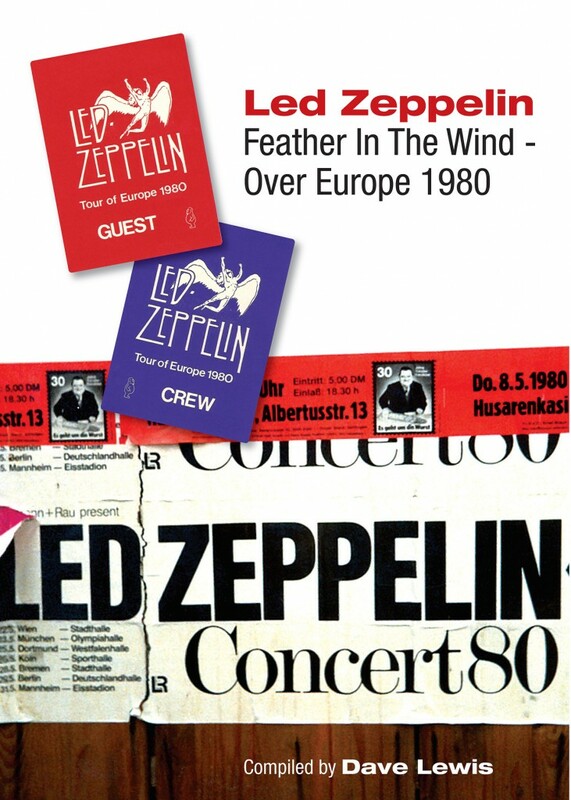 To celebrate the 35th anniversary of the Over Europe tour this summer – for a limited period the price of the Feather In The Wind book has been massively reduced – the book price is now just £8 plus postage and packing – a massive saving of £17 on the cover price. So sad to hear the passing of Yes bassist and co founder Chris Squire age 67 -their music had a massive impression on me in the early 70s – I remember seeing him backstage at the Led Zep Earls Court party on the last night….pioneering bassist simple as…and what a band…Chris of course worked with Jimmy Page on the XYZ sessions in 1981. There’s some YouTube clips in tribute below. RIP a fantastic musician. 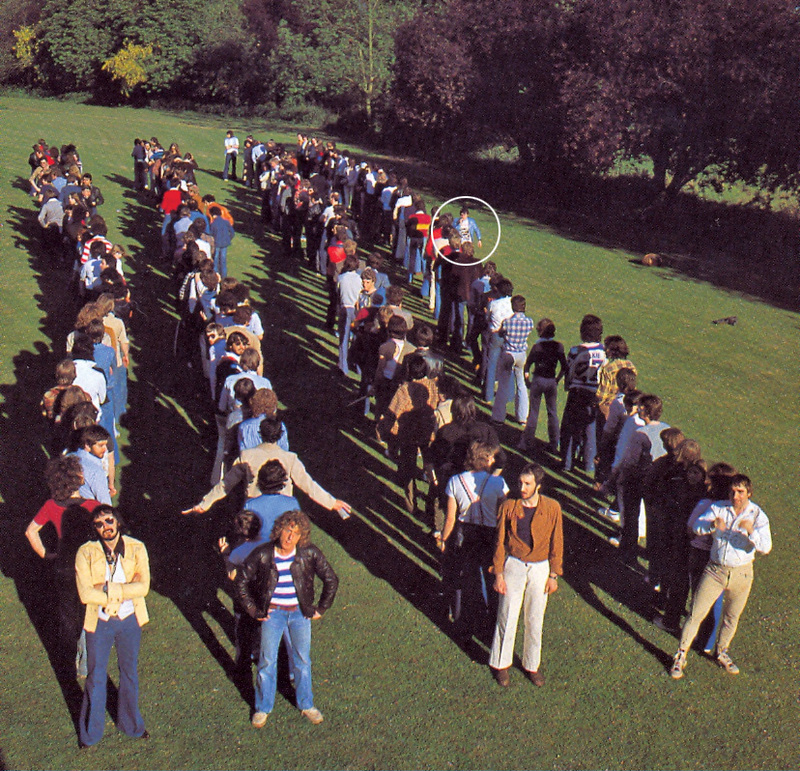 June 26: TBL Throwback Sunday – as The Who are playing Glastonbury tonight here’s one from the DL/Who archive – this pic was taken in the gardens of Shepperton Studios in the afternoon of May 25 1978 after we had watched The Who film a set for the Kids Are Alright film. 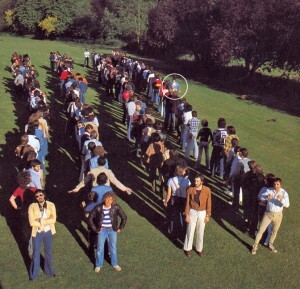 This was an idea for a possible sleeve for The Who Are You album – the idea being the audience lined up behind John, Roger, Pete and Keith and became clones of the band ie the Who Are You…we were all asked to get in …line as the photos were taken – I can be seen getting in line in the light turquoise jacket as circled (you are there somewhere Dec and Yvonne!) . To quantify my thoughts – Baba O Reilly was awesome for me – we may not see their like again and one last hurrah…well it did it for me… Rogers vocals – yes not what they were – Pete still on it…I saw the full set at the 02 in March and they really cooked …the Glastonbury TV set was edited which lost the continuity of the show I saw in March. It still was very good and it’s the flippin Oooo! Still….for now. July 1: David Bowie Retro 2: Five years on from the Earls Court Bowie gig almost to the day – on July 3 1983, I attended the David Bowie show at the Milton Keynes Bowl. This was on the Serious Moonlight tour. I attended this with my good friend Tom and the late and much missed Alan Johnston – along with the good lady Janet during our early days of going out together. Another great gig….32 years gone phew! …….And phew what a scorcher… the heat has been just amazing here this last few days. We just don’t get this sort of weather! It won’t last of course Yesterday I sweltered in the heat here as I was sticking stamps and labels on envelopes in preparation for the TBL 39 mail out. Adam and I stayed up to watch the England team in the semi final of the Women’s World Cup. Such a shame they did not make it through as they deserved, losing 2-1 to Japan with a last minute unfortunate own goal. On the player, some suitable hot tunes and albums that sound particularly good when the heat is on -The Loving Spoonful Summer In the City, The Rolling Stones Black And Blue album, Zep Houses Of The Holy, Zep Burn Like A Candle LA ’72, Bowie Young Americans, Frank Sinatra A Man Alone, Burt Bacharach Hitmaker – Burt was superb at Glastonbury – all of 87 years old. Miles Davis In A Silent Way, Paul Weller Hit Parade (enjoyed his Glastonbury set too) and The Yes Album in tribute to Chris Squire. 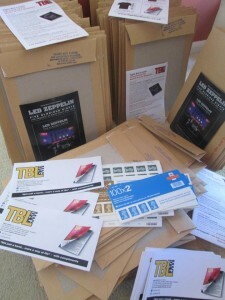 The next few days will be taken up preparing for the TBL 39 mail out and then once the stock is here shipping it out to over 30 countries across the globe. 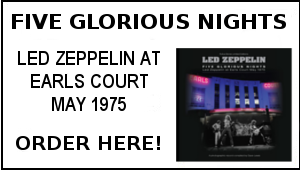 Ahead there’s some promotion for the Earls Court book, the usual summer push for TBL books and T -shirts (be seen in the coolest Led Zep t -shirts this summer! 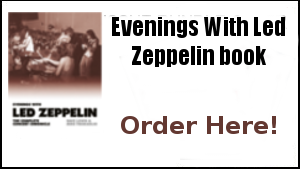 ), coverage of the three final reissues and I’ll also be turning my attention to the next TBL book project – this is the Evenings With Led Zeppelin in concert performance history which I am working on in collaboration with Mike Tremaglio. Alongside all that, I’ll be eying up potential contents for the next TBL issue number 40 due at the end of the year which is a bit of a landmark issue. In between all that, the good lady Janet and I really do need a holiday as it’s been full on for some months. Another fine magazine read Dave dropped about an hour ago and fully digested. How you manage to keep up this standard of work is amazing ,Look forward to the book next. Ray youre not wrong and it is a point ive raised with Dave Lewis via his facebook page with the adjusted title above.Why indeed is the 23rd not included when it is used in the memerobilia sections.They are also easier,I belive, to identify than any other night.Of course the cherrry jacket appeared throughout europe and USA but i dont believe JPs black dragon suit was ever complete till Earls Court.Would have thought the model figure would have appeared in the rear of the book too. Also as the book is dedicated to Howard Mylett it seems odd that the numerous pictures that carry his name of RP in cherry jacket at EC are not in evidence. The strat that was used on the 17th also reappeared on the 23rd and there is photographic evidence of this with JP in full dragon suit complete with RP in cherry jacket at his side. Off stage the infamous backstage photocall in front of caravan inludes the cherry on the 23rd. Another days,the 18th,dating device is the position and folds of the towel on Pages amps,as I attended this night ive always been keen to find those that match. The black version of the “express” t shirt isnt shown either.I also had the unofficial “Led Zepplin”(sic)scarf(as seen in DVD held aloft by blonde)though mine was green. There are other pictures that D Lewis has come across before,eg those in Tenemans book(picture dating by D Lewis)which shows a couple of contact sheets by Brian Peake which have not reappeared. Personally I would have liked more dates re the pictures used but maybe thats just me but to omit the 23rd photographically is I imagine to someone who went that night only, is shocking. The fact that D Lewis went all 5 nights is something he appears to have taken for granted. Dave , just got back from a week in the lake district,to find the Zep Earls Court book had arrived. AWESOME !!!!! !.You & Rufus Stone have done a graet job.Time for a beer and a bit of No Quarter from may ’75.Cheers again. Got the Earls Court book last week what can I say, it really is a sterling job fantastic. I been on a ‘MAY DAZE 75’ overload this week with the book, watching the 24th/25th and listening to the shows. It really does bring it all back, and how you have put it all together is really great, well done mate. like a lot us Old Zeppelin fans (I was eighteen at the time do the maths) in the UK who were lucky enough to be at Earls Court these shows are special. 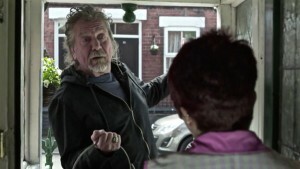 There is one thing I hope you can put me right on though, I have always been lead to believe that on the Friday night show the 23rd, Robert wore the Red and Black Cherry top ? and the other four nights wore the Black flowered top which seems to be more common in the Earls Court photographs we’ve seen over the years. There seems to be evidence of this on the Led Zeppelin wed site, also if you search hard enough on the net you can find photographs. 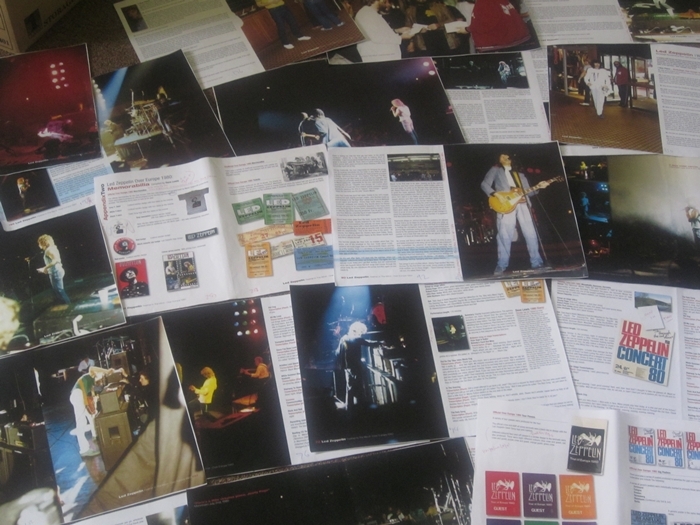 In Five Glorious Nights on page 277 (Selected magazine covers) there are five covers that show Robert in the cherry top, I have not seen any video evidence of the 23rd to support this though and I did not go to that night. So I am a little confused as there are no photo’s in the book of Robert wearing that top, so were are the Cherry top photo’s from ?. Anyway as I started off by saying the book is Epic thank you Dave I really don’t know were we would be without all your efforts you really do keep the flame lit. Looking forward to TBL 39 take care Dave and Thanks again. Thanks so much , had always read about xyz sessions ,didn’t realise there were out takes, but JP is unmistakeable. Thanks for sharing. Ordered The Earl´s Court book long ago,but now being worried,will I get it?can´t see when to pay for it!! !